It was a pretty day and I was pumped so I decided to install a rain chain. I watched the video on this page and went to work. I took down the old downspout and dug a 6″-deep pit. 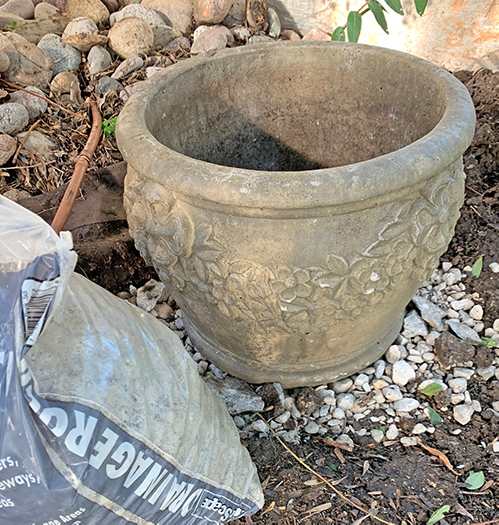 I moved a concrete urn from the backyard to the front, and then tried drilling the extra drainage holes in the bottom. Drilling 1/2″-thick concrete is hard so I decided instead to take a 41b. 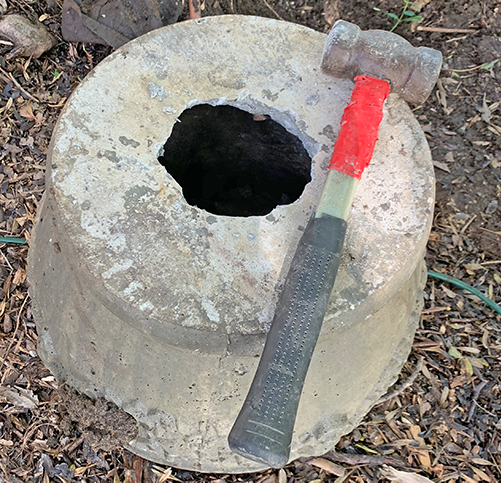 hammer to the bottom of the pot. Maybe it was because of the movie, but I found whacking the concrete to be very satisfying. I bought 2 really heavy bags of gravel at Lowe’s, and emptied one of them into the pit. Then I centered the pot under the hole in the gutter, on the gravel. I had to order a rain chain and it came today. We are going to have the trim painted and new gutters installed soon so I’m going to wait to add more gravel to the pot. Once I do, I’ll top all the gravel with river rock to make it pretty. I’ll be sure to post photos of the rain chain in action the next time it rains and I’m home to see it. OK, enough of that… back to quilt-related things :-). This entry was posted in Garden, Home Improvement by Becky Goldsmith. Bookmark the permalink. So capable! JLC ain’t got nuthin’ on you! Haha! You are such a multi talented lady! Had never heard of a “rain chain” before, so I had to do some research. Some of them are really beautiful and probably something good to have where you actually get rain, so you have given me a great idea for our new home closer to where you live. Thanks, Becky! Do you rent out your talents for installation? Sadly, no, I don’t rent out… but I am good for sharing youtubes! That’s really cool. I’ve never seen that done before.